Despite massive hype over virtual reality headsets such as the Oculus Rift and HTC Vive, there’s been a distinct lack of recognizable brand-name games for virtual reality to date. Most of the games currently available are indie projects, from adventurous small teams of programmers experimenting with this new form of interactive entertainment. This makes Bethesda’s VR games some of the first “big-name” games to come to PC-based virtual reality. (Sony has a large catalog coming to PlayStation VR later in 2016.) 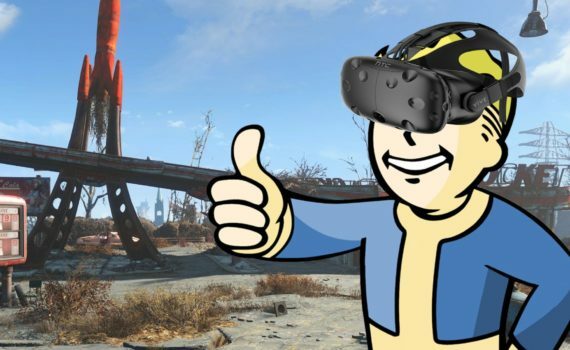 But the choice of Fallout 4 and Doom is a potential litmus test for traditional gaming experiences in VR. That’s because both of these games are first-person experiences involving a lot of walking and running. That kind of locomotion is standard for PC and console games, but less common in VR, where the past several years of hardware and software development have been built around divining the types of VR games that won’t cause feelings of motion sickness in players. That means just about any VR game you play today involves standing in one spot (or physically moving within the HTC Vive’s roomspace boundaries), and teleporting around a virtual environment with a point-and-click system, rather than using a gamepad or directional controller to move in real-time. How do you make a game like Fallout 4 (or Doom) work in VR? Would the open-world experience be too jarring to enjoy for more than a few minutes? These are important questions as bigger brand-name games take the first tentative steps towards virtual reality. For Fallout 4, the solution chosen by the game’s developers is the same as used by most VR games — a teleport system that can instantly blink you anywhere within a few yards. The left Vive controller represents the game’s Pip-Boy wearable computer (essentially a menu system) and the right Vive controller acts as a gun. At least in this demo, the game’s pause-and-attack tactical VATS system was not available. Strapping into Fallout 4 in VR for the first time was like taking a new look at a very familiar world, and the basic look and feel of the game’s ruined landscapes gave us a well-known baseline to judge against. In fact, you’re actually transported to the familiar Red Rocket Truck Stop, located just a short walk from the town of Sanctuary. You’ve even got the game’s second best companion along with you: Dogmeat. As a VR experience, it was a little light on interactivity. You’re either looking at your Pip-Boy or firing your gun, which — rather conveniently — comes with unlimited ammo. Both of those were floating in mid-air, with no arms or hands rendered in. It meant while you could teleport yourself around the Red Rocket, you weren’t able to grab any of the stuff lying around, which is really almost the main point of Fallout 4 these days. It’s also not clear how the hopping style of moving around will gel with a game world as massive as the Commonwealth, even with the existing fast travel system via Pip-Boy. It was a quick, scripted experience, with a small group of raiders arriving in time to meet some of your bullets. The combat felt a little weak, to be honest. Limbs shot off in classic Fallout style. While the look was unmistakably Fallout, the feel was a little generic and it will be interesting to see how they address that before the final product. In all, I think the demo raised more questions than it answered. Doom was a somewhat different experience. Fast paced and best played on a traditional desktop with a keyboard and mouse, the VR version feels very different. After a quick tour (via a similar teleport system) of a control room with holographic representations of the game’s guns and monsters, the actual gameplay was very simple: stand in one spot, while shooting and lobbing grenades at an oncoming horde. It’s a short-form game idea at best right now, so it will be interesting to see how this develops, or even if Bethesda takes it any further. The choice of Doom is especially apt, as the very first games CNET’s Dan Ackerman ever tried in VR was Doom 3. This was back in 2012, on a very early Oculus Rift prototype, literally a pair of ski goggles covered with black tape, with a low-res 1,280×800 display shoved inside. Jumping into Doom 3 back then was shockingly immersive, even at that prototype’s very low resolutions and without the advanced motion tracking the current retail versions of VR headsets use. But that first-person experience was also like being on an out-of-control roller coaster, and since then much of the development work in VR has been around solving the motion problem, through position-sensing cameras and advanced motion tracking. The VR version of Fallout 4 is coming to HTC Vive in early 2017. VR Doom may follow later, but Bethesda provided no further details on a release date.